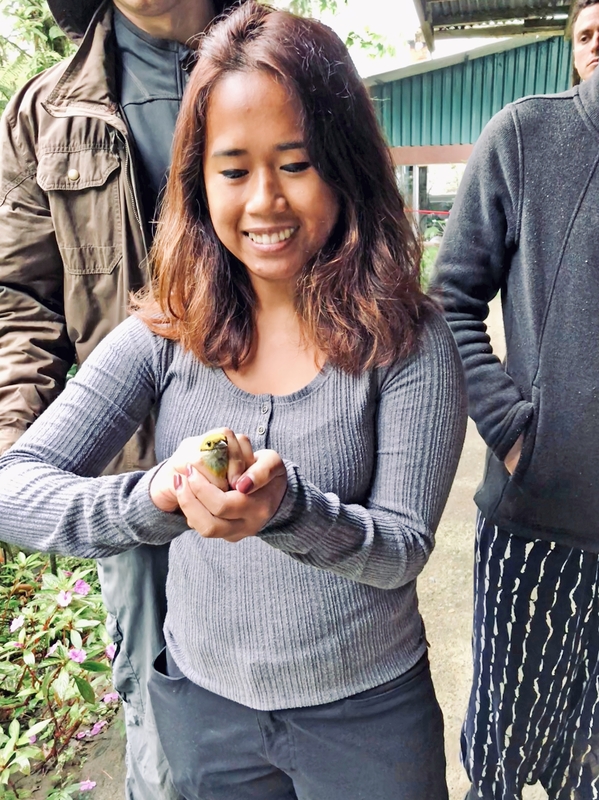 Pioneer Valley High School alumna and current Cal Lutheran University student Angelika Pasion (pictured) holds a bird she captured while conducting a research project in Costa Rica. After a summer of researching and observing animal behavior, Angelika Pasion discovered two things that humans and Vietnamese pot-bellied pigs have in common: They love to eat and sleep. “It’s similar to humans, which I thought was pretty funny,” Pasion told the Sun. Pasion, a Pioneer Valley High School alumna, is now in her third year of undergraduate school at Cal Lutheran University. The biology major spent much of her 2018 spring and summer researching animal behavior. Her projects—one a behavioral observation of two pot-bellied pigs at Moorpark College, and the other a look at the impacts of human settlements on birds in Costa Rica—were made possible by a $1.16 million federal grant awarded to Cal Lutheran in 2017. The grant allowed the university to launch its own rendition of the Ronald E. McNair Post-Baccalaureate Achievement Program, which is aimed at diversifying the pool of people with doctorates and graduate-level education. The federally funded educational outreach program is open to high-achieving undergraduates who are low-income, first-generation college students, or of a traditionally underserved ethnicity or gender. Pasion was born in the Philippines and moved to Santa Maria when she was 7 years old. She’s a first-generation college student, and although she said her tuition is being paid for almost entirely by scholarships, she attends school full time while working two jobs. Her schedule is packed, but Pasion said the McNair Program has helped her prepare for graduate school through its support for research opportunities she wouldn’t normally have. Although Pasion said she’s always been interested in getting a medical degree—she’d like to be a pediatrician one day—her high school science classes sparked her interest in biology and animals. “I’ve always been a big fan of animals,” she said, adding that she likes all kinds too. She wanted to study pot-bellied pigs because they’re famously intelligent, and she heard that Moorpark’s zoo kept its pot-bellied pigs mentally stimulated by training them for shows. Pasion said she studied two pigs, Bubbles and Eleanor, before and after a number of their live shows. She found that they seemed happier and appeared to sleep longer after doing well in a show, probably, she said, because they’re rewarded with treats while doing tricks. Like other McNair Scholars, Pasion also has had the opportunity to present her research at various conferences. But the program, she said, has given her more than just experience conducting and presenting research. It’s helped her prepare for the upcoming graduate program application process, develop a personal statement, study for the infamously difficult entry tests, and overall, it’s made her a stronger candidate for graduate school. The research she’s done through the McNair Program has also made her consider pursuing a dual degree, one in the medical field and another in either microbiology or humanology. Most of all, it’s given her a sense of support and encouragement that she had yet to find in college. Pasion is one of about 30 students involved in Cal Lutheran’s McNair Program, according to Director Janet Awokoya, who said the grant funding will last five years and is only meant to support about 25 students at a time. “We’re currently supporting 30 because there is a huge need for these services on the campus” Awokoya said. Low-income, first generation, and historically underserved ethnicities and genders face educational obstacles other students don’t, Awokoya said. The goal of this program is to help those students get over those hurdles and through doctoral programs. The lack of diversity represented in doctoral programs is an issue that impacts students across the nation and world, she said.